Any new players, coaches, football personnel, or prospective sponsors are invited to join us for the upcoming season. The Clinton Irish Blizzard have had a very successful ten years as part of the Eastern Football League and continue to look for quality personnel who wish to be part of a winner. Clinton boasts a great football family in a great football town. Contact us directly by phone or email (see below). 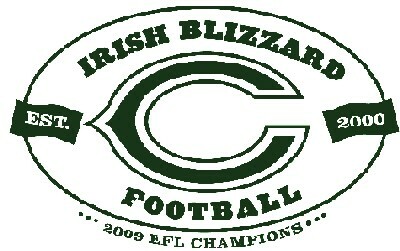 - During the season, drop by a practice and say hello to Coach Peete and the rest of the Irish Blizzard.